so may you please tell me what to do now from that screen to play that mission with the planes in that mission file ? The planes in the qmb files are only placeholders. What you need to do is to select how many (Num. 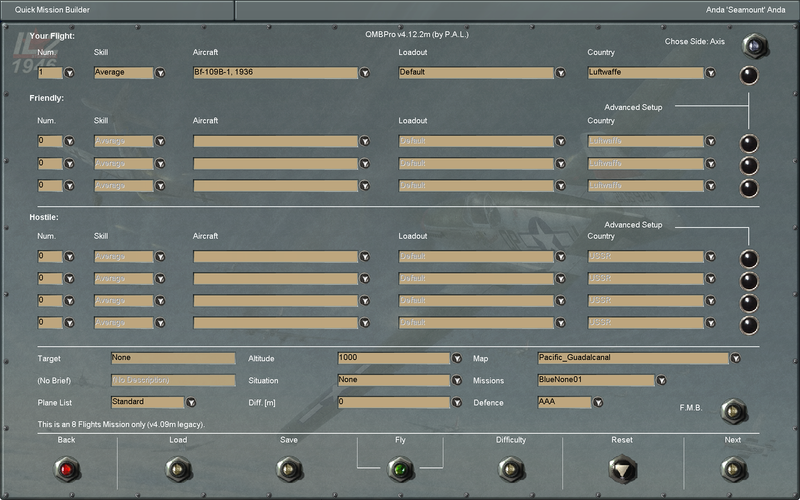 column) and what type (Aircraft column) of friendly and hostile/enemy planes you want and press fly. If you press 'next' in the lower right corner you can adjust the weather. Where it says 'Bluenone01' you can select the mission type. I think the QMB Pro works more or less the same as the stock QMB, only a few features were added. I find the FMB button the most useful, because it enables me to make quick adjustments without the need to search for the file I want to mod. So there is no way to "automatically" play them with the "default" planes defined in the mission file ? I mean without having to define many planes for each mission ? That would be comfortable, but no. The whole point of the QMB is that you can select what planes you want on that map. You can then save and load these missions. It's not that hard to make and save one mission for each map.